Oh, the scent of peonies! 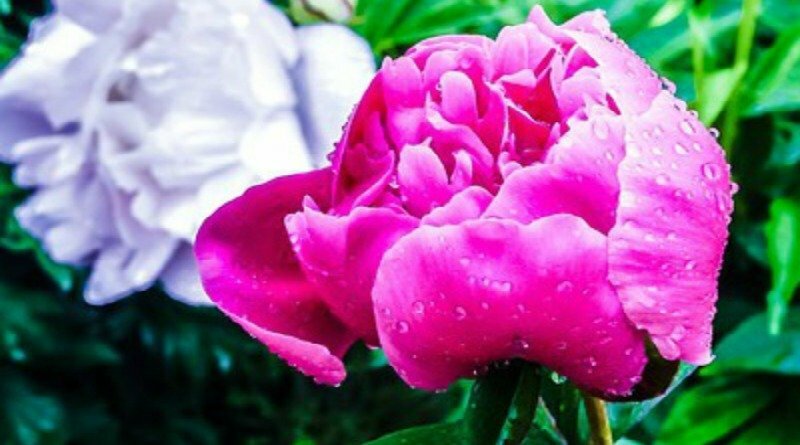 Nothing is quite like the sweet scent of peonies in spring and early summer. Those lush flowers, heavy with dew, are one of my garden’s most anticipated sights. I love the beautiful luscious blossoms surrounded with deep green leaves growing from a thick supporting bush whose leaves will stay beautiful and neat until frost causes it to die back to the ground in cold weather. Peonies are a garden staple for most of us. 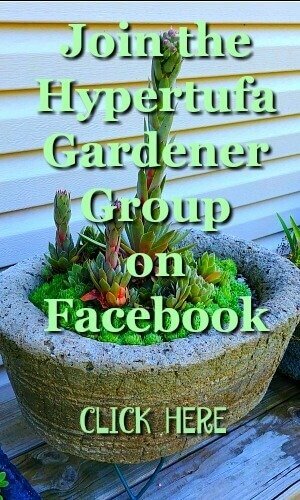 Once you get them into the garden and growing well, you have a keeper since these plants have been known to grow without dividing for over 50 years! You can dig up and divide if you are wanting to put new planting in other places, but this is best done in the early fall (September) so that the new plant roots have time to settle in and develop anchored roots before the freeze occurs. 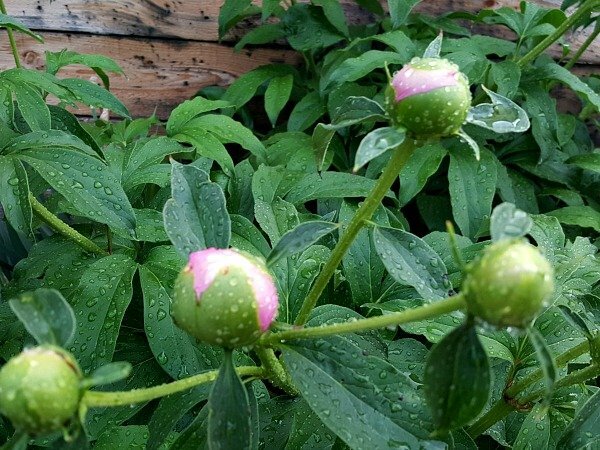 If you divide or move a peony plant, it may take a few years before it is ready to resume blooming again. 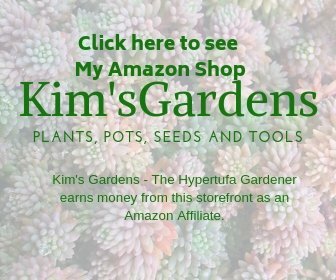 If you purchase new plants in the spring sales, these potted plants are fine to plant at this time of year though they sometimes may need an adjustment year before blooming. Be sure to plant those only as deeply as they are planted in the pots from the nursery. The most common problem of non-blooming peonies is that the roots are planted too deeply. 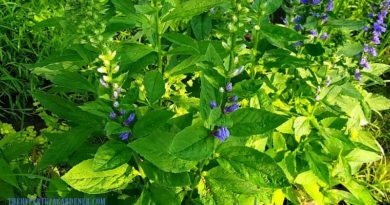 Zone 3-8 Full sun, mostly sun… Well drained loamy soil… Size 3ft tall, 3ft wide… Plant spaced out to promote good air circulation… Cold winter needed for bud formation.. Herbaceous..dies to ground in winter, sprouts new plant in spring. If you are dividing an established plant, be sure to cut those root divisions into pieces leaving 3 to 5 “eyes” or growing points on each section. These are the little growing tips which are small pinkish/purple growth spots emerging from the root. The roots are like a big branching carrot stem and you will need to cut with a sharp knife. 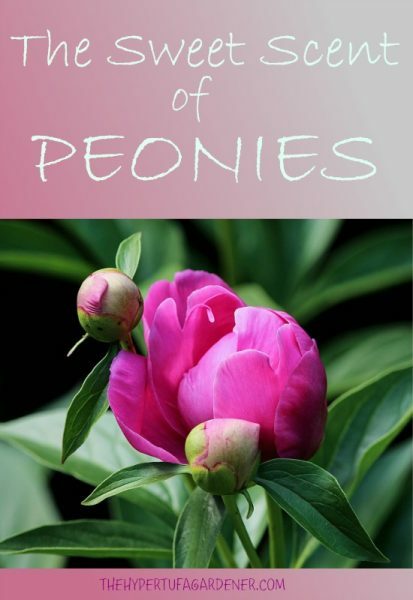 Your peonies will grow quickly in the spring and unfurl their stems which are reddish in the beginning. 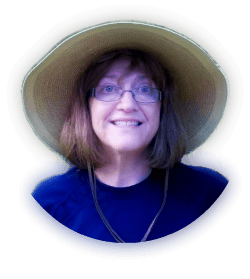 You will see buds forming and some gardeners dis-bud or remove buds to increase the size of the remaining flower, but I just grow mine naturally as nature intends. You may find sticky nectar on the buds which attracts ants, but the ants don’t harm the bud and you don’t need to worry about them…unless they decide to build a nest under your peonies………….Ants are a continuing problem in my garden and I really don’t have a solution there. When blooming is ongoing and when it is finished, be sure to deadhead the spent flowers back to a leaf joint. This keeps the plant neat and also keeps the area around the plant clean. 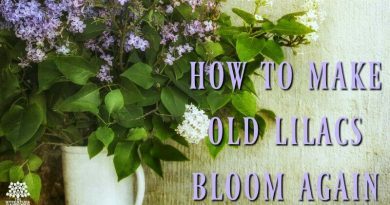 It also keeps the plant from trying to make seeds in that spent flower; you want it to spend its energy on growing great roots and storing energy for next year. When deadheading, take a basket and place gently under the blooms because just the slightest touch sends a cascade of falling petals! 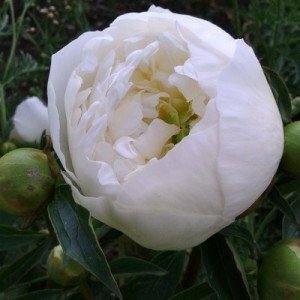 Peonies have beautiful foliage all year long, so deadhead to keep them neat and you will have a nice backdrop for your other garden flowers. It is such a deep shade of green and I wish all plants out of bloom were this nice. In the fall after a killing frost, cut the stems down to about 5-6 inches and discard the stems in the trash. This will help protect your garden from botrytis or grey mold which may be in the foliage and infect the roots. Leave the short piece of stem on the plant as it will locate your new growing tips for next spring.and it is the site where the new growth will appear: at the base of the old stem. I put a small circle of fence around my peonies as a support for the blooms during the year. In the fall, I leave that support up so that it marks the spot where my peonies are located. I also put leaves lightly into the circle of fence as a protective mulch. Remember, we don’t want to add mulch on top which would bury the roots further down ( resulting in no blooms) so just a light covering of leaves is recommended. 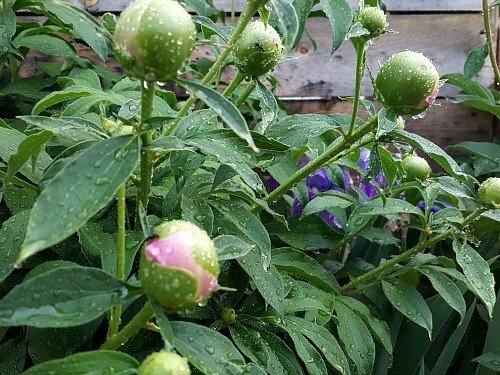 So are your peonies budding? Already in bloom? I took some pictures early this morning after the rain stopped. I have a lot of buds this year, but one of the plants seems a little spindly and thin looking. I may have to move that one to more sun. But it looks like I will be having bouquets inside soon….with that heavenly scent. What about you? ← Bewitching Stunning Wisteria – Isn’t It In Fairy Tales? Old Overgrown Lilac? Cut It Way Back After Blooming! 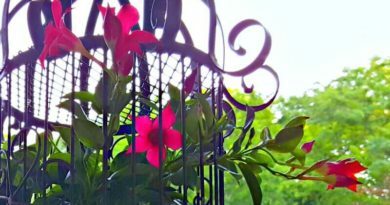 Dipladenia or Mandevilla – I Have It Caged!